Although the production level of sand maker has been greatly improved, there is still problem in operation process for improper operation or some external forces. Then, generally speaking, what may lead to the blockage during production? Firstly, during the production, some artificial factors will result in excessively fast speed or overlarge of material feeding, which will consequently block the equipment. For the solution of the problem, we need to watch some changes of the equipment during working, especially the change of ampere meter. If the ampere meter moves to fast, you should pay attention to the blockage situation. Secondly, blockage may happen to discharging pipelines of sand maker equipment. The possible reason is that the caliber of the product is not consistent with pipeline standards. It depends on our adjustments on equipment before the production. 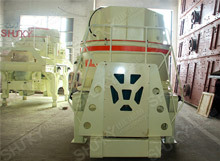 Nowadays, sand maker equipment can simultaneously produce sand with different specifications and sizes. Therefore, we should be particularly careful with the adjustment of the critical parts during production. Thirdly, if serious aging happens to sand maker machine or the humidity and viscosity of the processed materials are higher, blockage will also happen. For such problem, we should pay attention to equipment maintenance. Besides, the character of the materials should be processed.